Since we’re homeschooling, we decided to convert our dining room into a school room. We painted the walls a soothing yellow, found some bargain bookshelves and painted them the color that my four-year-old picked – blue, and we were gifted a round table and chairs. We also found some school desks, and we let him inherit daddy’s old computer. Ta-da. It’s a great learning space, and we’re already using it a lot. I’m amazed that in four short years, we have acquired quite a few educational materials. It’s nice to have a place to put these things, and I feel that having easy access to them will encourage my son to use them more often. I’m enjoying the colors very much too. It’s bright and airy without being distracting. I’m curious. 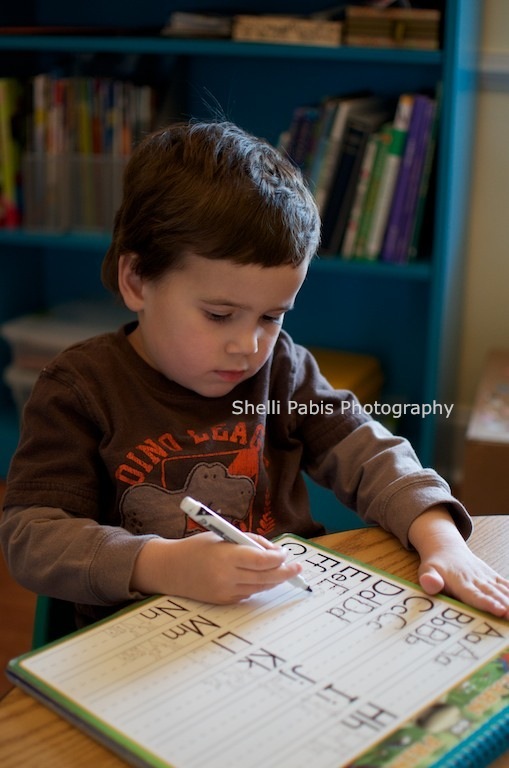 Do other homeschoolers create a space in their homes for learning? Or maybe you don’t homeschool, but you have a place for your children to do their homework? Do you think it’s beneficial to them? What kinds of things do you put in this space? On another note, I don’t really like calling it a “school room.” Do you have any suggestions for me? We have been very happy with the room, and we use it almost everyday. My four-year-old can access his writing and drawing tools more easily, and I think this has encouraged him to do activities like this more often. Unfortunately, the 17-month-old is tall, so our shelves are top-heavy. It’s rather cluttered and hard to get at things. Hopefully once we’re passed this stage of grab-everything-he-can-get-a-hold-of, we can put it back into a more manageable order. For some reason, I kept calling the room, “the activity room,” so that has stuck. 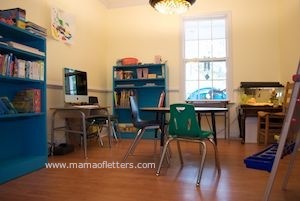 I found this helpful column by Rose Godfrey about setting up her homeschool room. She says, “After 12 years of homeschooling, I still cannot define the ideal homeschool workspace.” Homeschool workplaces can be anywhere and can suit our own tastes. I am glad that I got my son’s input when setting up our space too. That’s the best name yet, Sarah! Thanks for sharing!